It’s no secret that vital biodiversity hotspots in Southeast Asia are under threat from logging and the spread of oil palm plantations. Biologists and conservationists have studied the effects of habitat degradation on individual species, but have rarely investigated how logging and conversion of rainforests to oil palm agriculture change interspecies relationships. A study of a toad and its ant prey found that while the toad dwindled in disturbed habitats, a shortage of food was not the reason. Giant river toad. Photo credit: Rhett A. Butler. The study focused on the relationship between the giant river toad (Phrynoidis juxtaspera), so-named because females can reach 8.5 inches long, and the ants it feeds on in the forests of northern Borneo. 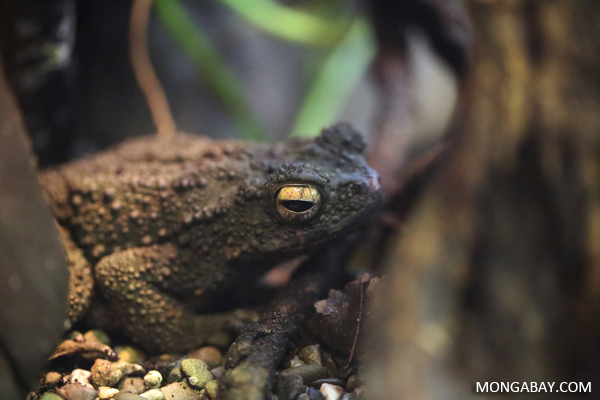 An international team of five researchers surveyed toads and ants in three different habitats: natural unlogged forests, logged forests, and oil palm plantations. The researchers used a headlamp to hunt toads at night in streams in the three habitat types. They pumped the stomachs of a total of 189 toads to learn what the toads had eaten, finding nearly 17,000 prey, most of them ants. They released the toads afterwards. The researchers used pitfall traps to survey ants near streams in the three habitats, collecting a total of nearly 66,000 ants belonging to 140 species. Unsurprisingly, they found fewer toads in the more disturbed habitats—as measured by the amount of remaining forest canopy cover. But ants showed the opposite pattern. They became both more abundant and more diverse at sites with the least forest canopy. Intriguingly, the habitat disturbance did not seem to have much effect on the composition of ant species eaten by the toads. Except, that is, when it came to the yellow crazy ant (Anoplolepis gracilipes). This invasive species was found almost exclusively in oil palm plantations, where it was among the most common ants and where the toads took to eating it preferentially. Mature, young, and newly cleared palm oil plantations in the Malaysian state of Sabah on Borneo. Photo credit: Jeremy Hance, Mongabay.com. “This suggests that predator–prey interactions can be mostly maintained with habitat disturbance despite shifts in the community composition of potential prey, and even that some predators are capable of exploiting new prey sources in novel ecosystems,” the researchers write in the paper, which was published in the journal Global Ecology and Conservation. The fact that there were few toads in disturbed habitats despite plenty of ants suggests something other than a lack of food is driving them out. “[O]ther factors, such as changes in breeding habitat availability, microclimate or pesticides are more likely to be driving the decline in giant river toad numbers,” the researchers write. Moreover, even in oil palm plantations, some streams had a decent amount of forest canopy cover, and the number of toads in these was comparable with the number in logged forest streams. If intact river corridors can be maintained in logged or agricultural landscapes, native frogs and toads might stand a chance. Konopik, O., Gray, C.L., Ulmar Grafe, T., Steffan-Dewenter, I., and Fayle, T.M.From Rainforest to Oil Palm Plantations: Shifts in Predator Population and Prey Communities, but Resistant Interactions. Global Ecology and Conservation 2: 385-394. (2014). No Comments to "A toad’s relationship with its prey endures in the face of deforestation for palm oil"